Trust is a major component of any relationship, but especially a working relationship. If I can’t trust you, there is no point in trying to negotiate a deal or work collaboratively together. Knowing that trust is so important to our ability to reach work goals, it’s surprising that we are rarely encouraged as part of our career development to assess how much we trust ourselves. While trust is essential to building a relationship, it’s often our hidden mistrust of ourselves that points us in the wrong directions, undermines our power at work and derails the goals that mean the most to us. When we trust ourselves, we distinctly know our capabilities, limitations and possibilities. We can prevail through any stress or long hours that inevitably will occur. We know that the decisions we’re making are the right ones. We can be honest with ourselves and others and say what we really mean. That last point, “say what we really mean,” is often the opposite of what we’ve been taught to do in the workplace. Saying what we really mean and doing what we really want to do are not what we’ve been told will lead to success. For example, I’ve spent most of my career learning how to create a brand that led to a positive perception of my status, motivations and abilities. I was 15 years into my professional career before it occurred to me that I might attract even better opportunities if I were honest with myself about what I actually enjoyed doing and what truly motivated me. And it turned out that I wasn’t motivated by pursuing more money or titles. I discovered deep desires and work goals that I’d been dismissing or ignoring completely because I couldn’t trust myself to listen for or pursue the work in which I’d be most fulfilled, and also most effective. “Living in power” is about knowing who you are and making choices that honor your true self. To trust yourself, you have to get in the habit of seeing and acting on what’s true for you moment to moment. Trust is formed by habit, not one single decision or feeling. You can’t quickly decide to trust yourself. Like all other relationships, you have to prove to yourself that you can be trusted. 1. Start with small decisions. What will you wear to work? How will you get to work? Will you take the scenic route or the regular route during your commute? All of these small and seemingly meaningless decisions create a habit of trust or reinforce a pattern of mistrust. Ask yourself: Did you pause to discover what you really wanted before making these decisions? Did you instead direct yourself to an old routine or an otherwise inauthentic choice? 2. Examine your motivations. What’s driving your decisions? Are you trying to please others? Do you have an outdated or warped view of what’s expected of you? Are you afraid of revealing who you actually are to others, or even to yourself? These are just a few of the motivations that may be driving your small and large decisions and undermining your ability to trust yourself. 3. Identify gaps. If you’re like me, you’ve spent a significant period of your life failing to see and reveal your true self. In the meantime, you’ve built a life around who you wanted people to see. For me, it took time to reflect on and identify the gaps between who I intrinsically am and who others knew me to be. Identify these gaps and consider how you might trust yourself to show up more fully in the future. 4. Reveal what is true. Start at any pace that feels comfortable to you, but work toward revealing your true self in the workplace. Be honest about how you feel and more bold in asking for what you want. Are you comfortable asking for the assignments that interest you most? Are you comfortable carving out time to work on the goals that are your highest priority? 5. Take it one day at a time. Like most journeys worth taking, learning to trust ourselves is difficult, nuanced and must be part of a daily practice. If you find yourself failing to honor your truth, simply start over again and again and again. Kourtney Whitehead has focused her career on helping people reach their work goals, from executive searches to counseling to career transitions, through her positions at top executive recruiting firms and consulting companies. Her site, SimplyService.org, is an online community focused on supporting the creation of spiritually centered work lives. She is a sought-after speaker and podcast guest. 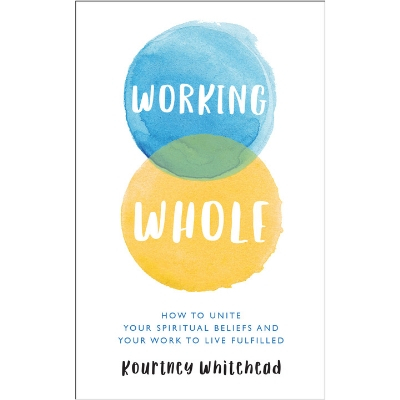 Her new book, Working Whole, shares how to unite spiritual and work life. Learn more at SimplyService.org.